MK Oren Hazan seeks to apologize to MK Ilan Gilon after calling him "half a human being". Gilon refuses to accept the apology. 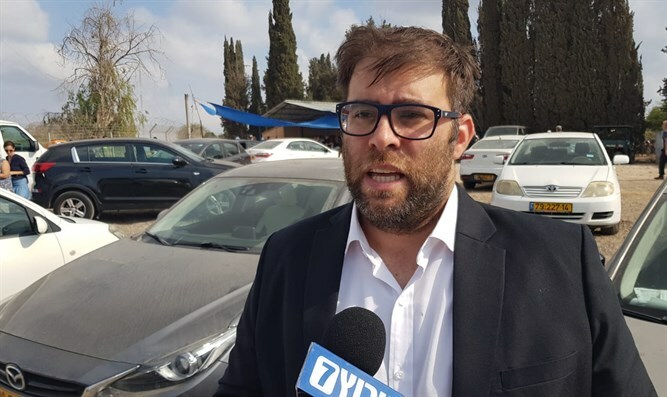 MK Oren Hazan (Likud) on Wednesday sought to apologize to MK Ilan Gilon (Meretz) after calling him "half a human being" during a heated debate in the Knesset earlier this week. In a video posted on the Internet, Hazan is seen reaching out to Gilon, who refuses to shake Hazan’s hand and ignores his gesture. "You know what, Oren, I do not want to," said Gilon. "Forget it. One day we'll talk. There is no point." Gilon then asked Hazan, "Is there anyone with whom you have not quarreled yet?" Hazan, for his part, reminded Gilon that he had called Hazan an idiot in the past. Gilon did not reply. Hazan’s remarks caused a firestorm in the Knesset, due to the fact that Gilon is handicapped as a result of polio he suffered as a child. Hazan denied his remarks were meant to mock Gilon’s disability. Earlier on Wednesday, Prime Minister Binyamin Netanyahu issued a statement regarding remarks made by both Hazan (Likud) and MK Elazar Stern (Yesh Atid), who insinuated on Tuesday that Culture and Sport Minister Miri Regev slept her way up the Israeli military ladder. "The recent statements heard in the Knesset are inappropriate and have no place in the Israeli discourse. I am in favor of vehement and sometimes even sarcastic arguments, as long as they transact with respect and relate to the matter at hand and not to a person's body. I am against offensive or chauvinist discourse that does not respect the Knesset and us as public emissaries," said Netanyahu.